Content warning: this is an AFLW article. As required by AFL media rules, your browser will prevent you from leaving this page or reading any other news stories until you have read this AFLW article and ticked the box to acknowledge your unqualified support for the league and for Gillon McLachlan and all his descendants. Up front I should say the following – despite my club not having a team this year, I’m a big fan of the AFLW so far. I haven’t even seen my Hawks’ JLT games, but I’ve recorded and watched through all of my adopted Bulldogs and Lions’ AFLW outings. Why those two? The Bears were always my ‘second team’, so that was a walk-up start, and I felt I also needed a Victorian team, hence I picked the Bulldogs, the least offensive of the four. And at the start of the competition I expected this would mean one successful team and one battler, and so it turned out – it’s just the opposite of what was expected. 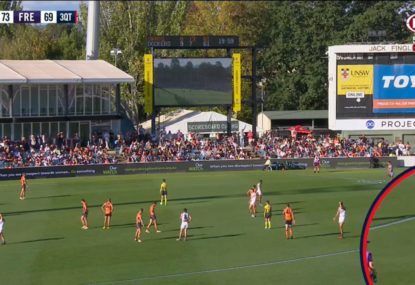 So let’s talk about AFLW in terms of actual football. After five rounds what are be some of the differences between the teams that are winning and those that are losing? Clearances are one of the ‘stats that matter’ in the men’s game, but in the AFLW the opposite seems to be true. The Bulldogs, GWS and Fremantle, with just two wins between them, are all in the top four for clearances, yet the two teams with the fewest clearances are Adelaide and Brisbane, the likely grand finalists. Why is this? It may have something to do with the state of disposal efficiency at this stage – too many clearances are being handed straight back to the opposition, who then usually have more space to create meaningful possession than the clearance player did. Disposal efficiency should improve as the competition matures, but it may also mean that teams need to structure their lists less towards inside, ‘get-ball’ midfielders and more towards speedy outside players. 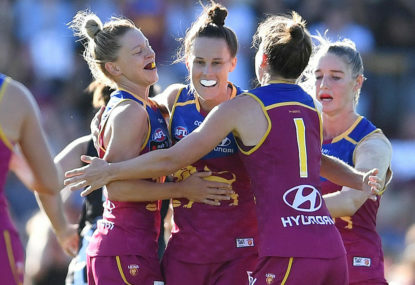 The Bulldogs seem to have too many of the former – in and under players like Brooke Lochland, Ange Gogos and Jamie Lambert – who are racking up clearances. 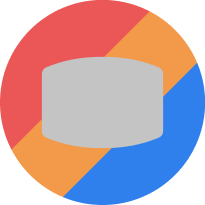 Their commitment cannot be faulted, but their disposal efficiency and decision-making aren’t up to the task. Contrast that with the Lions, whose more impactful players have been speedsters like Kate McCarthy and Kaitlyn Ashmore. It was always going to be likely that there would be a bit of a gulf between the abilities of the marquee and priority draftees, who are experienced local league players with refined game sense and skills, and of the rest. In the Bulldogs’ case this gulf has been the size of Mexico’s. Ellie Blackburn has made a case to be considered among the top five players in the competition and Emma Kearney is a strong clearance player who racks up touches and usually makes good decisions. After that, however, particularly with Katie Brennan’s injury, there’s miles of daylight to the next group. Against Carlton, Blackburn had to be taken off the ball because she was the only legitimate threat up forward. Most other lists have better depth, particularly the Lions side. No Lions player up to the start of round five was averaging more than 12.5 touches a game. Despite two marquee key forwards, their top goal scorers include McCarthy and several other smalls. Ashmore and Emily Bates are standouts, but there’s an even spread of contributors that goes ten to fifteen players deep. 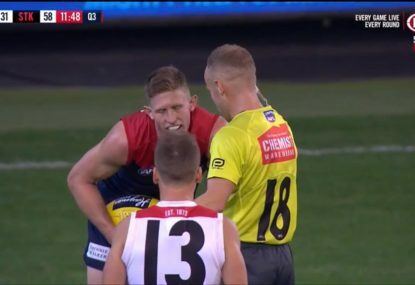 Pearce, Paxman, O’Dea and Mithen give Melbourne a deep midfield, and of course Adelaide’s forward line is packed with threats even outside of Tex Perkins and Erin Phillips. The solution is time – time sufficient for a greater talent pool to develop through the junior leagues now in existence. Scoring has proven a bit tough in the first few rounds. Forty-metre set shots are of limited value given the shorter kicking power and the windy local grounds in use for the foreseeable future. Strategies need to change towards getting the ball inside 20 metres for set shots. Ground-level offensive pressure is a must, being a combination of agility and strength. Erin Phillips is doing this well, and Darcy Vescio is a key forward in the way that Jarryd Roughead is – capable of an overhead mark but deadly when the ball hits the ground. After Moana Hope’s first game it looked like big key forwards may be doomed, but since then Tex, the Brisbane big two, Alyssa Mifsud and others have shown it’s possible to make hay in that position. The key is to get close enough to goal for the set shot to be feasible and for midfielders to mix up their targets so that defences can’t double and triple-team. There are very few defenders over about 175 centimetres, so there’s no reason why smaller players shouldn’t be able to take marks in the forward line. 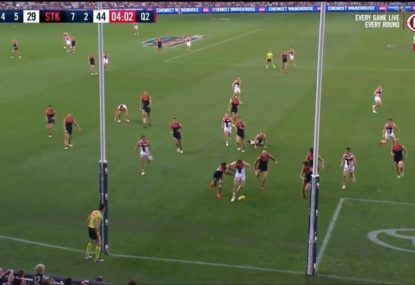 The 50-metre penalty is already showing itself to be mammoth in the AFLW given it’s a kick and a half rather than just a kick, and a number of teams need to put some work into concepts like the east-west movement on the mark to avoid giving away pointless 50-metre penalties. On the weekend the Dogs gave away a 50 and compounded it by failing to run downfield to man the mark, which turned a static kick from half-back into a running start in space near half-forward. 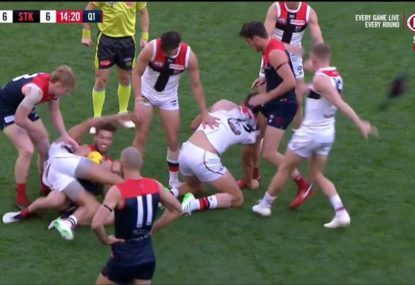 Since week one it’s been clear that umpires are using free kicks to try to sort out some of the congestion, so players need to be more aware that they can’t give the umpire an easy out by slinging players in tackles, letting stray arms wander high or diving on the ball, all of which the umpires have been red-hot on so far. 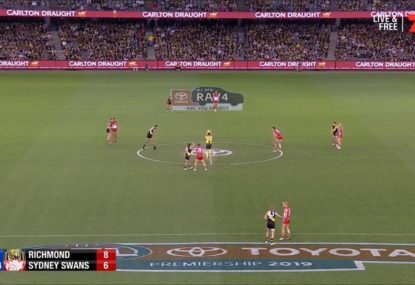 Finally, as a Hawks fan, I know the value of non-possession football – tap-ons, soccer kicks, deliberate tap-downs from marking contests and the like. I’ve been surprised how little of this is occurring in the AFLW so far. The instinct of players too often seems to be to try to take possession, which is leading to fumbles and congestion. 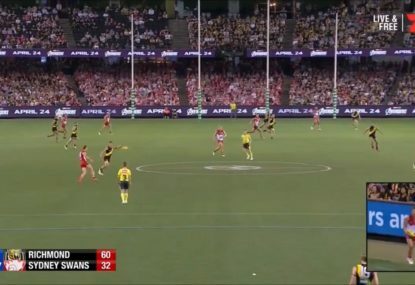 It doesn’t require big muscles to deftly tap a ball into the path of a teammate and open up a play, and I think this is a real game-smarts opportunity for AFLW players. As far as I’m concerned, this kind of play can be as exciting as a big mark. Have you picked up any play or strategy difference in the AFLW game this season?